Apologies for the lack of updates on my blog. I am hoping to get back into updating pages with information in regards to further training and information on pink missions. BJJ fundamentals and Intermediate BJJ with Team Raphael Dos Santos, Gracie Barra Cornwall, Blackwater, with Coach Tim Lukes. Apologies for lack of updates since my return from Thailand. Having started a new job as a contractor IT Lecturer my efforts have been focused more on the delivery of lessons for 17-19 year olds, very challenging and very demanding on the energy. However, things are looking positive and today the Pink Training Machine will embark on another 8 week training programme. I shall endeavour to share some fitness workouts with you, some will be short and sharp(and very tough), but hopefully these will be useful to those of you who also have full time jobs/ children and struggle to fit in good training sessions to increase stamina, burn fat and build on core strength. Today is a non training day! I now have 6 days before I fight on Tiger Muay Thai's BBQ Beatdown 44. This is a monthly fight show that Tiger hold at their camp. Not sure who my match up is with as of yet but my training has now been reduced to 1hr private plus cardio instead of doing 2 classes each day. Last night I couldn't sleep... I then start thinking about combinations and what if ? fighting scenarios with my unknown opponent...I'm sure this is mental preparation and happens to everyone but it does get annoying that the brain decides to do all of this thinking when you are actually trying to sleep. I have managed to skip chess lessons! Had a great day sunbathing it was nice to chillax beside the pool and soak up the sun. Today I was very lazy and had some sunbathing time by the pool instead of clinch training. This afternoon I had a gruelling chess lesson with Andy... To the point I was going to cry as I cannot remember all of the differing scenarios and tactics.... I let off some steam in a boxing 121 session at Tiger Muay Thai. 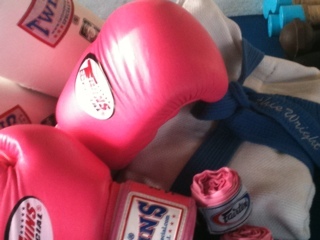 After training I noticed a fabulous looking and very strong, shapely Muay Thai female fighter. This lady did the most beautiful Wai Kru I have ever seen!... She was being filmed by a camera crew so I sat aside and watched them for a while. (I probably looked like a stalker lol) She was so friendly came over and spoke to me, we talked about training and she said she was from Norway, had 22 MT fights and was looking at fighting in MMA very soon too. At 33 years of age I think she looks amazing. Every one... this is Me with Fatima Pinto - Muay Thai fighter from Norway fights at 51kg soon to start fighting at 55kg. 37 Years Young, Engaged to Infamous Andy "The Rock" Costello" who totally inspired me to train in BJJ ... even though he didnt agree with it at the time lol. I have a wonderful 18 year old son Tyrian Ryder who lives in Plymouth My family live in the sticks of Cornwall. I have lots of wonderful friends dotted about the country who I don't see but... we know we are always there for each other.